We thought it was about time we produced another blog covering some of the FAQs we receive. This time, they’re covering commercial movers. What is a commercial mover? There isn’t a standard definition but it broadly means a removals company that either specialises or has expertise, in commercial moves. That usually means offices and other related premises but it can also include factories, plant and equipment and commercial goods ex-warehouse. How is this different to domestic removals? Commercial movers might typically see very little difference in most cases. 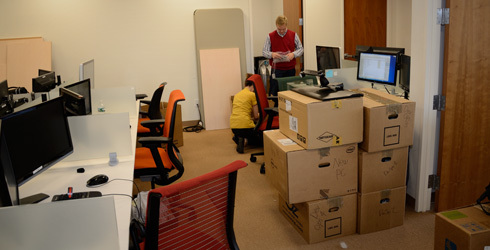 Clearly packing office desks and tables is very much like packing household furniture. Files and office items are carefully packed into boxes, just like domestic household items would be. Of course, some commercial removals ARE different. Moving plant and machinery out of a factory is a very different thing and might involve cranes and special vehicles for transport. there may be additional risk and value issues in some commercial circumstances and that might mean very different insurance requirements. Can you handle any sort of commercial move? We say “almost” because while we at Christchurch Removals have extensive expertise as commercial movers, we do need to look at each case and its specific parameters. So, for example, it might be that your commercial move involves highly hazardous substances, in which case we might need to seek specialist guidance. Just discuss your needs with us though and we’ll make it happen! Can you respond to urgent removal requirements? We will certainly always do our best but it is important to plan ahead if humanly possible. Commercial movers tend to be booked in advance and providing only a few days’ notice might cause you some logistical problems. Please just speak to us sooner rather than later – even if you haven’t confirmation or a firm date in mind. We will then be able to perhaps “pencil something in”.